One in four teenage girls in the United States has a sexually-transmitted disease, a study has indicated. The study, by the federal Centers for Disease Control and Prevention (CDC), found an even higher prevalence of STDs among black girls. 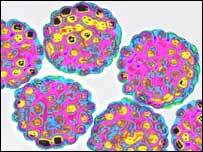 A virus that causes cervical cancer - HPV - was the most common, followed by chlamydia, trichomoniasis and herpes. The CDC says the study is the first in its kind to examine the prevalence of common sexually transmitted diseases among adolescent girls. It found that nearly half of the African-American girls surveyed had at least one STD, while the rate was 20% among white and Mexican-American teenagers. Human papillomavirus, or HPV, affected 18% of the girls surveyed, chlamydia 4%, trichomoniasis 2.5%, and herpes simplex virus 2%. The CDC's Devin Fenton said it was a serious issue because the diseases could lead to infertility and cervical cancer. "Screening, vaccination and other prevention strategies for sexually active women are among our highest public health priorities," he said. The CDC is recommending annual chlamydia screening for all sexually active women under 25, and HPV vaccines for girls aged 11 to 12, followed by booster injections. John Douglas, the CDC's head of STD prevention, says screenings are underused because teenagers often do not think they are at risk. Analysts say some doctors are also reluctant to discuss screening with teenage patients because of confidentiality concerns, knowing parents would have to be told of the results.